Store, protect, and transport your valuable photo, electronic, or other gear with the waterproof and dustproof lime 910 Case with Foam from NANUK. The case features a removable cubed form insert, and a foam piece for the inner lid. PowerClaw latches and holes for optional user-supplied padlocks provide secure closure. Users will appreciate the strong NK-7 resin construction, automatic pressure release valve, integrated lid stay, and large, folding, soft-grip handle. The 910 case is stackable with same-size cases. 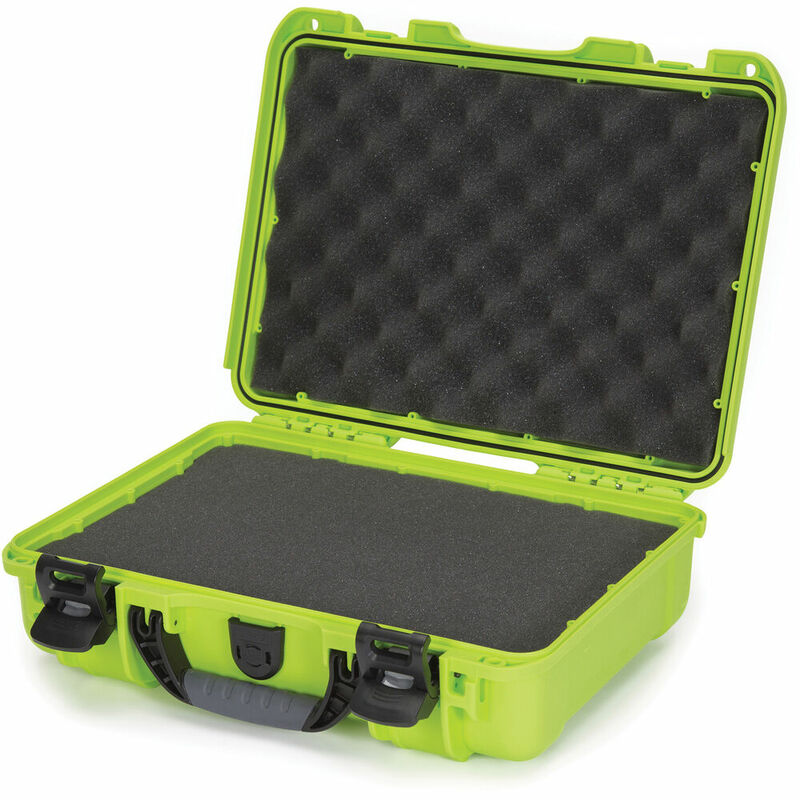 Box Dimensions (LxWxH) 14.6 x 12.0 x 4.9"
910 Case with Foam (Lime) is rated 4.9 out of 5 by 23. Rated 5 out of 5 by Ed from Great case. Nice latch system. The model 910 is the first Nanuk case that I purchased. I always buy the other popular brand (you know who), but they didn't quite have the dimensions I wanted so I decided to give Nanuk a shot. I'm glad I did because I'm very impressed with the Nanuk case. It seems just as durable as the other brand, but I like the Nanuk latch system much better. I've heard others here say the same thing. The 910 is a small case that I use for some portable audio gear, but the next time I need to get a bigger case I'm going to give Nanuk a try for that also. If I like it as much as the 910, I may decide to switch brands going forward. Rated 5 out of 5 by Logue from Great Protection for Osmo Mobile I've used Pelican cases and this little case is one step better than the Pelicans I have used.The double latching system is a little cumbersome but worth the effort for the security against accidental openings. You can lock it with TSA locks on the front corners. I've configured the foam to hold my Osmo Mobile, the charger, the DJI stand, charging cables, a spare battery and the DJI Accessory bracket with an added quick release shoe. Plus I still have room for more spare batteries or perhaps a USB charger pack in the future??? Rated 5 out of 5 by Kenneth S. from Great case - Protective and sturdy This case is definitely an upgrade from Pelican. I'm sold on the Nanuk cases after this 910 purchase. I'm storing a binoviewer (similar to binoculars), accessories, and a set of telescope eyepieces in the case. Perfect size and very protective. Although both brands are protective and have similar features, the Nanuk has much better latches. The latches on my recently purchased Pelican 1500 case, which is a larger size than the 910, are very difficult to open and close requiring significant force and two hands. One had struggles with the latch while the other hand holds the case in place. Closing is also a two handed operation. They are the redesigned latches that are supposed to be easy to operate. The Nanuk latches are far superior and require much less force due to a well engineered latch. A gentle squeeze on the lever releases the catch and the latch can be opened with an additional lifting motion. It will not open accidentally. Closing is just as easy. Only one hand is needed to either open of close the latches. An excellent design! The case is sturdy and has a rigid feel when open or closed. The case also seems light for its size, which is a plus. The pick n' pluck foam is easy to configure and is similar to the Pelican foam. I'm very pleased with the Nanuk 910 case and will stay with the Nanuk line when I need another case. Highly recommended. Also, B and H Photo processed my special order for a graphite case quickly, and it arrived in only one week. The graphite color is a very attractive alternative to the standard black case. Rated 5 out of 5 by David from Well-made compact case I bought this for a Panasonic Lumix_DMC-LX3, which has detachable lenses and filters. The pick and pluck foam makes it very easy to customize and provides very good protection. The case is well-made and sturdy, yet lightweight. I looked at several brands and felt that the build (especially the clasps), was much better on this than on comparably priced Pelican cases. Make sure you get the right size: The first one I bought was too small. Rated 4 out of 5 by Tomorrow Lab from Pretty good case We needed to transport valuable prototypes from on place to another in a stylish, not overly complicated case, and this one fit them perfectly. I would have preferred if the foam had a more flexible layering system instead of one height fits all, as some items were larger/thicker than others, but we used the extra foam to make do. Rated 5 out of 5 by Anonymous from Great Case Can't beat the quality and the price, the case is extremely durable and made to last. The latches are top quality and will last a lifetime. I will definitely pit them at the top with Pelican cases. B&H's fast shipping and excellent customer service made the transaction great. Rated 5 out of 5 by dg27 from Excellent, sturdy case I use this for a Lumix LX3 plus the additional lenses, charger, filters, etc. If you plan well, you can make the most of the space. The foam is very easy to remove as needed. I prefer the clasps, handle, and overall build on this to any of the Pelicans. Rated 5 out of 5 by ROBERT M. from Love it, easy opening and closing We have several of these and love them. They are light weight, strong, and easy to open and close. that as I see it is a major advantage over many other cases. Also the colors are very nice. We use the case to store and travel our camera monitors. Will this adequately fit a Nikon D5300?